■Used together with point soldering machine. ■Response to big size P.C.B（ 250×350mm）, M size. ■Not necessary for customized tools. 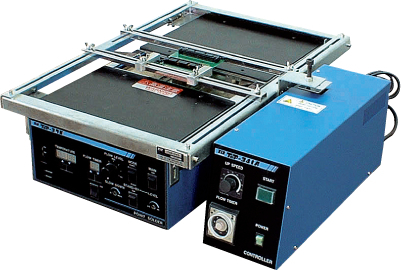 ■Quality and productivity for soldering is up. Setting GUIDE on P.C.B（ X.Y positioning）. Then start switch "ON" and automatic operation safe. Soldering position is variable in X-Y direction. Flow timer and up-speed are adjustable. Original slow-up function for prevent icicle, bridging. Easy setting up for unit type.